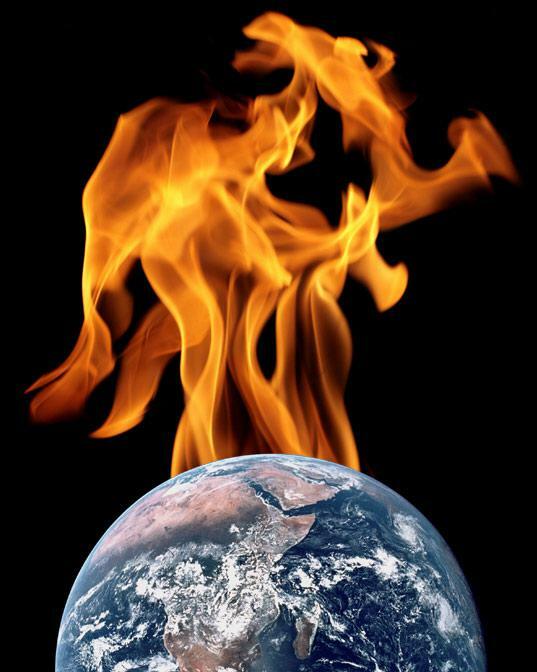 Follow-up: House Science Committee global warming tweet debunked again. If the GOP-controlled House of Representatives gets its way. Photo illustration by Phil Plait. Photos by peasap/Flickr and NASA. Last week, I wrote about an appalling tweet by the U.S. House of Representatives Committee on Science, Space, and Technology. The committee—currently run by a GOP majority—has a history of outrageous climate change denial, and also has a history of tweeting about it. But even for them, the tweet from Thursday was outrageous: It linked to a ridiculously bad article by climate change denier James Delingpole, who is known for ramping up the hyperbole to 11 when he writes on global warming. He in turn got his bad data from another noted denier, David Rose, writing for the Daily Mail, the Mos Eisley tavern of anti-reality aficionados. The claim made by Rose is simple: Temperatures since February 2016 have plummeted by a full degree Celsius in more recent months, casting doubt on the reality of global warming. As I pointed out in my own article (and with far greater detail given by Tamino at the blog Open Mind), Rose’s claim is completely wrong. He cherry-picked data so severely that they’re essentially meaningless; the equivalent of flipping a coin once, having it come up heads, and then declaring it always comes up heads. He looked at patchy data with high uncertainty from a very short time period and tries to make conclusions about it. What he (and in turn Delingpole and then the House Committee on Science) ignored was the trend. These shenanigans have been graphically debunked by climatologist Gavin Schmidt, who is the director of the NASA Goddard Institute for Space Studies, and is a noted expert in climate change. This is what the deniers don’t want you to see: the trend. To create this animation, Schmidt used land surface temperatures from GISTEMP, which is measured using a variety of methods including meteorological stations. He shows that yes, there is a large drop from earlier this year to October, due in part to El Niño subsiding. If all you see is the first frame of this animation, you might suppose something really is weird! But there’s more. The second frame shows the same measurements going back much further in time, to 1970. The y-axis is what’s called the “temperature anomaly,” the deviation from some average (in this case, the temperatures from 1951 to 1980; if the anomaly is 0, then you’re right on average, if it’s a degree above average it’s shown as +1, and so on). As you can see, once you look back more than a few months or even years, there is a clear upward trend to the temperatures. The third frame overplots the average temperature for each year in red, making the trend more clear (the dashed line is an estimate for the rest of 2016 using previous years as a guide). The fourth frame corrects those averages for El Niño (the technical name is El Niño-Southern Oscillation, or ENSO); it’s actually not a huge correction, and again the trend is clear. The fifth frame shows a mathematical fit to the data to just show the trend, and as you can see it’s heading up. The other thing to notice here is that we see lots of very short-term fluctuations, some swinging more than a degree over small periods. But that’s not surprising! The shorter the time, the more you expect the temperature to move; the average daily temperatures over a week can be all over the place, but the annual average temperatures should be relatively stable from year to year. Yet, despite that, the trend is obvious: The world is heating up. This is precisely why we say Rose was cherry-picking. Whatever his motivations, he only showed a very limited slice of what’s really going on, and in that way hid reality from everyone who didn’t know to look deeper. Or who didn’t want to look deeper. As I’ve written before, the science is the science, but the inconvenient truth about global warming is that it goes against a lot of political ideology, especially when that ideology is fueled by money from the oil industry. And without a doubt that’s why the House Science Committee took to Twitter; it wanted to advance its dogma, truth be damned. It is not interested in actual science, or in reality. It is only interested in its agenda, and that agenda is to further the cause of fossil fuel, even if it means setting the world on fire.